Background: The Coherex WaveCrest Left Atrial Appendage (LAA) occlusion device is not yet approved by the FDA for use in the U.S. The WaveCrest is similar in purpose to the Boston Scientific Watchman™ LAA Closure Device (which is FDA approved). Dr. Tom De Potter of Aalst, Belgium, presented a live case in which he installed a Coherex WaveCrest Left Atrial Appendage (LAA) occlusion device in an 84-year-old female with longstanding A-Fib and a bleeding problem. The WaveCrest has roll-out anchors which are then fixed into the sides of the LAA. It comes in three sizes to fit different LAA openings. He spent a good deal of time and attention washing and immersing the WaveCrest in water to make sure there were no bubbles. When the device is expanded inside the LAA, it can be repositioned and recaptured. Dr. Potter seemed to tug and firmly push and pull the device to anchor it. After insertion, it requires 2 months of dual antiplatelet therapy. WaveCrest is from Coherex Medical, Inc., a subsidiary of Biosense Webster/Johnson & Johnson. Video still frames of Coherex WaveCrest occlusion device positioned in LAA. To me the WaveCrest seemed similar to Boston Scientific Watchman LAA Closure Device which did all the heavy lifting to be the first LAA occlusion device to get U.S. FDA approval. I didn’t see major significant advantages of the WaveCrest. Though it’s always good for EPs to have a choice of devices when closing off the LAA. For more on the Watchman, see my article, The Watchman™ Device: An Alternative to Blood Thinners. On the Thursday session on Left Atrial Appendage Closure, two live cases were presented via streaming video from around the world. Note: The Amplatzer™ Amulet™ Left Atrial Appendage (LAA) Occluder, is not yet approved by the FDA for use in the U.S. It is similar in purpose to the Boston Scientific Watchman™ LAA Closure Device (which is FDA approved). The Amplatzer™ Amulet™ is from Abbott (formerly St. Jude Medical). Patient Background: An 81-year-old lady with acute hypertension was in permanent A-Fib since 2016. Her CHADS2VASc score was 5 (at the top of the risk range), her HAS-BLED score was 4 (high for one year risk of major bleeding). She had suffered syncope (fainting) episodes and had a history of major bleeding on anticoagulants (the reason for the LAA closure). On the positive side, her Ejection Fraction was a healthy 61%. Dr. Claudio Tondo from Milan, Italy, demonstrated an LAA Closure by inserting an Amplatzer LAA closure device. The Amplatzer has two lips which close over both the outside and the inside of the LAA―like a sandwich. It comes in different sizes to fit better into different sized LAAs. One advantage of the Amplatzer is less risk of leaking because the inside and outside lips overlap the opening of the LAA. Over time, heart tissue grows over the implant, becoming part of the heart. Dr. Tondo described her LAA shape as “chicken wing” which is usually an LAA shape easier to close off. It appeared relatively easy to insert the device into the patient’s LAA, then fit it snugly into the LAA opening. Dr. Tondo and his team used a type of dye pumped in behind the Amplatzer to see if there was any blow back or leaking. Once that was done, they simply disconnected the catheter used to insert the Amplatzer. About this patient: This 81-year-old lady was in a very difficult, risky situation. Her stroke risk was very high, but she couldn’t take anticoagulants to prevent a stroke because they caused her bleeding. By inserting the Amplatzer Amulet device to close off her Left Atrial Appendage (LAA), Dr. Tondo would significantly lower her risk of an A-Fib stroke which mostly comes from the LAA. Her persistent A-Fib was very symptomatic with dangerous fainting episodes. She needed a catheter ablation to get her back into normal sinus rhythm. Dr. Tondo planned to perform the PVI as soon as possible after her LAA closure. About the Amplatzer Amulet: Having previously watched the Watchman Device procedure, to me the Amplatzer Amulet seemed simpler to insert. Though both are relatively easy to install. One potential problem with an Amulet might occur if a subsequent catheter ablation requires the LAA to be mapped and isolated. It will be harder to do so because the lips of the Amulet cover the LAA opening. In Europe, the Amplatzer Amulet is used to close holes in the septum (called ‘patent foramen ovale’, i.e. a hole in the heart that didn’t close the way it should after birth.). Once approved in the U.S. by the FDA, it will probably become a competitor or an alternative to the Watchman Device. Dr. Eric Pena, cardiac electrophysiologist at Rogue Regional Medical Center, discusses the risk of clots and stroke in A-Fib patients not on anti-coagulation drug therapy. The Left Atrial Appendage (LAA) of the heart is known to be a major source of these clots. He describes the LARIAT procedure, a lasso-shaped suture used to tie off the LAA and why at-risk A-Fib patients may consider the LARIAT. EP lab footage and animation. 2:41 min. Published by Asante on Apr 11, 2013. How and why the LARIAT is inserted. For some high-risk patients, the LARIAT procedure is used to tie off the left atrial appendage thereby eliminating this source of clots. The heart’s left atrial appendage, is known to be a major source of blood clots that can lead to strokes. Features Dr. Eric Pena of the Asante Rogue Regional Medical Center. (1:24 min. excerpt.) Published by Asante on Apr 11, 2013. Animation of how the Watchman is inserted. For some high-risk A-Fib patients, the WATCHMAN Left Atrial Appendage Closure device is implanted at the opening of the left atrial appendage (LAA) to trap blood clots before they exit the LAA. (The heart’s left atrial appendage is known to be a major source of blood clots that can lead to strokes.) (1:04 min.) Published by jonathan penn on Feb 22, 2014. When drug therapies fail or if not a candidate for catheter ablation, patients look to surgical treatments to reduce the risk of stroke, to ease symptoms or to cure their Atrial Fibrillation. If you are at high risk for stroke but can’t or don’t want to take anticoagulants, your doctor may suggest closing off the Left Atrial Appendage using an occluder such as the FDA approved Boston Scientific WATCHMAN™. How to Find a Specialist: Today, you can visit the Boston Scientific website to find medical centers installing the Watchman device; just enter a state or postal code. Use Steve’s List instead: When looking to install a Watchman device, I recommend you seek an electrophysiologist (EP) who is certified in “Clinical Cardiac Electrocardiography”. Use my list which is organized by state and city. Go to, Steve’s List of Specialists Installing the Watchman Device. To learn more about the Watchman, see: The Watchman Device: My Top 5 Articles. This live streaming video session from Milan, Italy, featured two Left Atrial Appendage occlusion devices: the Amplatzee Amulet from St. Jude Medical and the LAmbre from LifeTech Scientific. Live from Milan, Drs. Claudio Tondo, Antonio Dello Russo, Gaetano Fassini, and Massimo Moltrasio inserted an Amplatzer Amulet (St. Jude Medical) into the Left Atrial Appendage of a 78-year-old women who had a high risk of bleeding. (The LAA is the origin of 90%-95% of Atrial Fibrillation-related clots). Model of Patient’s LAA: These doctors did something I had never seen before. They made a physical model of the woman’s LAA, then showed how the Amplatzer Amulet fit into the model. This isn’t done in all cases of LAA occlusion, but was very helpful for the AF Symposium attendees to see how the Amplatz Amulet actually worked. The doctors also demonstrated how they could easily retract and recapture the device (which isn’t easy to do with the Watchman occlusion device [Boston Scientific]). Like the Watchman device, the Amulet also has hooks to hold the device in place. VIDEO ANIMATION: showing how the Amplatzer Amulet device is installed (1:14 min.) from St. Jude Medical. It seemed very easy to insert the Amplatzer device. It closed off the LAA opening with the bottom part completely covering the LAA opening into the left atrium. For most patients, this might be an advantage of the Amplatzer device over the Watchman occlusion device which doesn’t have this overlap and can sometimes leak around the edges. But, on the other hand, once the Amplatzer device is in place, the overlap of the LAA would prevent ablation and electrical isolation of the LAA should that be necessary. But in most cases, this isn’t often required. Later in the session when the moderators cut back to the live video stream from Milan, the EPs inserted a LAmbre (LifeTech Scientific) device in the LAA of a second patient. She was a 50-year-old woman who had a very small LAA. She had suffered two ischemic strokes within a month of each other, but she had bleeding problems when she took warfarin and dabigatran (Pradaxa). The LAmbre LAA occlusion device (LifeTech Scientific) seems similar to the Amplatz (St. Jude Medical) as both are fully recapturable and repositionable within the LAA. But each has its own anchor design to hold the device in place. But the LAmbre can fit into smaller size Left Atrial Appendages. I predict the Amplatzer Amulet from St. Jude Medical will soon be approved by the FDA for use in the U.S.
You’re on a blood thinner for your increased stroke risk from A-Fib. But you hate it. Is the monthly testing or diet restrictions a hassle? Is the increased risk of bleeding stressful? Have you developed side effects, e.g. gastrointestinal problems or poor kidney function? Maybe you just don’t want a lifetime on meds. Or, perhaps you’re unable to take a blood thinner for other medical reasons. What do you do? There is an alternative to taking blood thinners―closing off your Left Atrial Appendage (LAA) with the Watchman™, an occlusion device. The LAA, a small sack located at the top of your left atrium, is where 90-95% of A-Fib strokes originate. Inserting the Watchman is a very low risk procedure that takes as little as 20 minutes to install. Afterward, you usually don’t need to be on a blood thinner. He’s Got A-Fib but Can’t Take Blood Thinners: What to Do? We’ve posted a new personal A-Fib story. William F Covert tells about how in 2014 his A-Fib returned when he developed a serious lung problem. The new problem meant he could no longer take anticoagulants. So how was he going to deal with the increased risk of stroke due to having A-Fib? “My A-Fib symptoms started in 2012 with dizziness and constant fatigue. Several trips to my family physician proved to be futile. 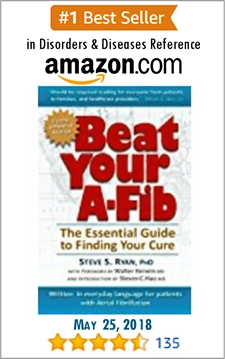 This was my introduction to the world of A-Fib! The cardiologist put me on Xarelto and after an electrocardioversion, I was A-Fib free…for 15 months. At first it was occasional. Then as time passed, it became more frequent and larger amounts. Doctors thought that the use of Xarelto was the probable cause of the bleeding and advised me to stop the anticoagulant for 6 weeks, and hopefully the bleeding would stop. GPA Disease Means No Blood Thinners: How to Deal with A-Fib Stroke Risk? My symptoms started with dizziness and constant fatigue. Several trips to my family physician proved to be futile. I saw a cardiologist the same day (November 2012) who put me on Xarelto (a blood thinner) and scheduled me for an Electrocardioversion a month later. 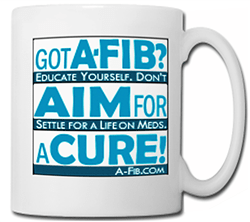 It was successful and kept me A-Fib free…for 15 months. After my cardioversion, I was prescribed Sotalol (an antiarrhythmic medicine) for 15 months. But when I went back into A-Fib, they discontinued the Sotalol. They felt that, since the Sotalol didn’t prevent me from relapsing into A-Fib, there was no use in taking it. I began to cough up drops of blood. At first it was occasional. Then as time passed, it became more frequent and larger amounts. Doctors thought that the use of Xarelto was the probable cause of the bleeding and advised me to stop the anticoagulant for 6 weeks, and hopefully the bleeding would stop. Unfortunately, it got worse. A second CAT scan 4 weeks later revealed my lungs were full of blood. I was diagnosed with a disease called Wegener’s (GPA-Granulomatosis with Polyangiitis), an uncommon disorder that causes inflammation of certain blood vessels. I was never told that Xarelto triggered the Wegener’s, but it certainly could make the bleeding worse. The Wegener’s (GPA) caused damage and bleeding to my lungs, and I went back into A-Fib on March 31, 2014. 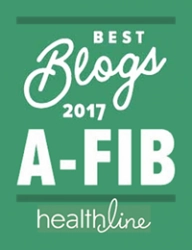 I was subsequently taken off of blood thinners and put on a low dose aspirin regimen to provide some element of safety from an A-Fib-related stroke. Because of the Wegener’s, I would not be able to take blood thinners like warfarin (Coumadin) or Xarelto on a long-term basis. I was acutely aware of the potential stroke possibility, because of being in A-Fib and not being able to take blood thinners. With A-Fib you need blood thinners to prevent a stroke. But Wegener’s (GPA) is a disease that causes bleeding. Blood thinners would only exacerbate the problem. I was acutely aware of the potential stroke possibility, because of being in A-Fib and not being able to take blood thinners. My cardiologist discussed the various alternatives to blood thinners. Some were invasive and not recommended because of my age (79). After a few visits, my cardiologist told me about a new procedure using the Watchman device which would both help protect me from an A-Fib stroke and afterwards not require me to take anticoagulants. If I decided to have the Watchman device installed, I would be required to be on the anticoagulant warfarin for 45 days afterwards. Then I’d need to take Plavix (similar to aspirin) for 6 months after that. Why Coumadin and Plavix After Installing the Watchman? In the U.S., the Food & Drug Administration (FDA) requires the use of warfarin after installing the Watchman because it takes about 45 days for the thin layer of heart tissue to grow over the device. This is to insure you won’t have any blood clots that could pass around it and cause a stroke. For someone like me with Wegener’s, even this short a time on warfarin and Plavix was risky. But the effects of a stroke would be for life or might kill me. My doctors would not offer their okay for me to be on warfarin and Plavix, even for that short a time. Getting a Second Opinion: I also visited the Mayo Clinic in Rochester, MN for a second opinion. The pulmonologist (specialist in lungs and respiratory system) said that, because my Wegener’s was then in remission, a short course of blood thinners would be OK. However, the cardiologist told me he did not recommend doing this. Bottom line: It had to be my decision. After researching and reading the reports about all the clinical trials in the U.S. and the Watchman success stories in Europe, I decided, “This is for me!” I would go for the Watchman. This was better odds for me. The procedure to insert the Watchman device took less than 2 hours at Ochsner Hospital, New Orleans, LA, January 20, 2016 by Dr. Stephen Ramee, Interventional Cardiologist. I was on warfarin for a total of 45 days, and now I’m on Plavix for 6 months―till the middle of September 2016. So far everything is going fine with me―but I’ll be glad when I’m finished with the Plavix. I have A-Fib symptoms all the time. I feel the fibrillation, and it causes dizziness and fatigue. But I am better in the AM and get more fatigued around 2:00 PM. This doesn’t keep me down. I take care of our yard, play golf and travel, etc. My blood pressure medicine has been adjusted to assist in decreasing the light-headedness and fatigue. However, the GPA (Wegener’s) medication that I have to take can also cause these types of reactions. I am now taking 100 mg of metoprolol daily which seems to be controlling my heart rate, although erratically. My heart rate is usually between 65-75 beats per minute. If you have A-Fib and have other heart issues that will not allow blood thinners, consider the Watchman device implant. I have never looked back and believe it was a great decision for me. Kudos to William for being proactive, educating himself, getting a second opinion and dealing with a very difficult situation. William’s dilemma is not unique. Many people with A-Fib can’t tolerate or react badly to anticoagulants. Without anticoagulants, they are 4-5 times more likely to suffer an A-Fib stroke. With 90%-95% of A-Fib clots coming from the Left Atrial Appendage (LAA), the Watchman device (and other occlusion devices) are a welcome alternative to anticoagulants. William Can Still Have a Catheter Ablation: While William is protected from A-Fib stroke, he still has A-Fib. If he so chooses, he can have a catheter ablation to fix his A-Fib. Many EPs routinely perform a catheter ablation on people who have had a Watchman device installed, especially in Europe where they have been using the Watchman device since 2004. See: A Watchman and Ablation Combo? Everything You Never Thought to Ask. Be proactive! Learn from William’s story. If he hadn’t done his own research and got second opinions, he might already have suffered an A-Fib stroke. For more about the Watchman, see my two articles: Watchman Device Option to Blood Thinners and Watchman Better Than a Life on Warfarin. 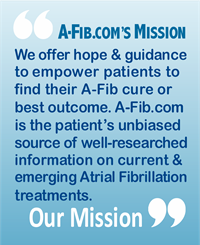 Read other stories of A-Fib patients dealing with Atrial Fibrillation: see Personal A-Fib Stories. In a recent study, 99% of subjects aged 65 or older had evidence of microbleeds; and closer examination of the cranial MRI images revealed an increased number of detectable microbleeds (i.e. the closer they looked, the more microbleeds they found). Microbleeds in the brain are thought to be a precursor of hemorrhagic stroke. Cerebral microbleeds (CMBs) are small chronic brain hemorrhages of the small vessels of the brain. If Microbleeds Cause Hemorrhagic Stroke, Should I be on a Blood Thinner? The fact that almost everyone 65 or older has microbleeds is astonishing and worrisome, particularly if you have A-Fib and have to take anticoagulants. Anticoagulants cause or increase bleeding. That’s how they work. In plain language, this study indicates that cerebral microbleeds lead to or cause hemorrhagic stroke. It’s not surprising then that some doctors are reluctant to prescribe heavy-duty anticoagulants to older A-Fib patients. Being older and already having microbleeds only makes taking anticoagulants all the more worrisome. 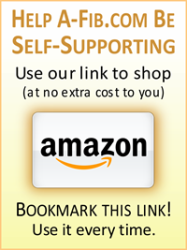 Taking almost any prescription medication has trade-offs. Older A-Fib patients find themselves between a rock and a hard place. In the case of anticoagulants, on one hand you get protection from having an A-Fib stroke (which often leads to death or severe disability), but on the other hand you have an increased risk of bleeding. 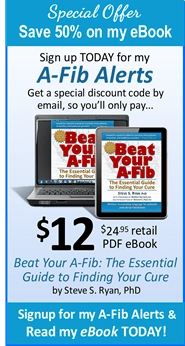 Patients with long-standing Atrial Fibrillation are often the hardest to make A-Fib free. Because of having been in A-Fib for so long, they may have developed many A-Fib producing spots in their heart besides in the Pulmonary Veins (PVs). To make them A-Fib free, the electrophysiologist (EP) must ablate (isolate) not only the Pulmonary Veins, but also many non-PV triggers. Isolating the Left Atrial Appendage (LAA) significantly increased the success of catheter ablation in long-standing persistent A-Fib patients. At 2 years, 76% of patients who had received standard ablation plus LAA isolation were free of arrhythmia vs 56% of patients who had received only a standard ablation. Isolating the LAA improved long-term freedom from persistent A-Fib.